There are a lot of records and parafernalia that you and I will never have. Even after all these years of collecting, I am more and more amazed of how much stuff there is: no matter how much i hear or see, there seems to be always more stuff than I can imagine. 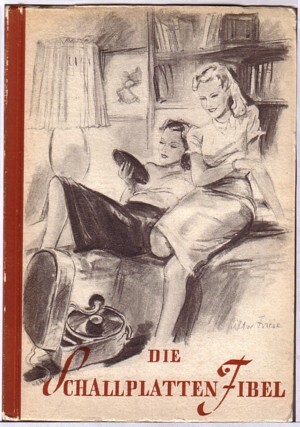 Recently I got hold of a copy of the book Die Schallplatten Fibel, published in 1939 by Reher Verlag in Berlin. It is a collection of articles about the history of the audio recording techniques. The fact that this technique was only half a century old when this book was written, doesn’t make the book less interesting today. In fact, the opposite is true. I would advise everybody who loves records to try and get this book! Apart from the beautiful illustrations and pictures of early recording equipment, there are some fascinating stories in the book. Like the story of the invention known as Die sprechende Turkin. I have read about this invention before, but the description in Die Schallplatten Fibel is so far the most detailed that I know of. 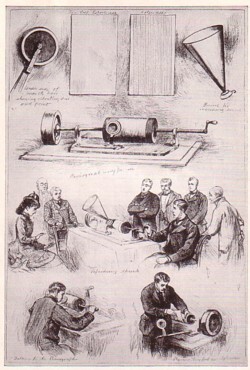 And there is an illustration of the miraculous machine! Die Sprechende Turkin was built in 1841 in Germany by a man named Faber. 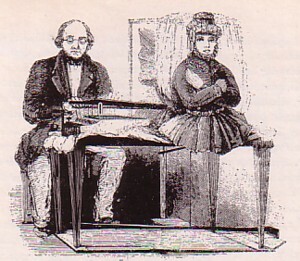 It was a mechanical talking machine; Faber made a throat, mouth, lips, tongue and teeth from iron and wood, which were operated by a keyboard. Air was pressed from a pair of bellows to imitate the lungs. Supposedly the machine gave a very good imitation of human speech. The Talking Turkish Woman could speak complete sentences and answer questions. Faber and his machine toured all over Europe and was last seen in 1901 in Berlin. It is a mystery what happened to it after that. Even better is the story of the gift of the German Reichstag to Adolf Hitler in the mid-thirties. 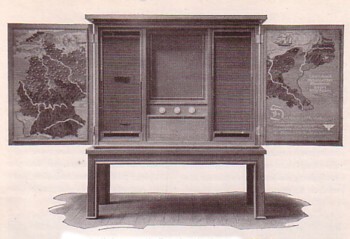 A cabinet with an inbuilt phonograph, 300 records, and a map of Germany on the inside of the doors. The records were especially made for the occasion and contained voices of men and women from all corners of Germany, who talked about there life. All 300 records were made in an edition of one. Little lights marked the places were the recordings were made. It seems like a genuine holy grail to me, but this is the first time I ever heard of the thing. And if there is a search going on for this monster, it is done in complete secrecy. What happened to this unique gadget? And how can it be that I never read or heard about it? Years ago I saw a documentory about flying machines. The name of this documentary was Gizmo and it was a compilation of old local television news material, mainly pre-WW2. Basically you saw proud builders of machines-with-wings climbing in their machine, only to crash down seconds later. In between the accidents there were a few fragments that showed other inventions. I remember I man who had built two railway trains that could “pass” eachother on one and the same track. One of the trains run over the other. An incredible sight! I recorded the audio of some inventions that had something to do with sound. It is a pity you cannot see what you hear, but like we say in Holland: it’s better that nothing. And altough I have never seen the documentary again, I guess it must be available somewhere. This is a guy using his mouth and hands yo make music. Here is a guy playing a bicycle pump.First solo and then with an orchestra. Here is a guy playing a hollow tree trunk. This is a man making music with his hands. This is a talking machine; if this is not fake (and it did not seem so) I really don’t understand why we had to wait another 50 years for another technique that could produce human speech.